Introduction: A short summary like this is by its very nature inadequate and needs to be balanced out and given more depth by the writings of professional theologians who have written books about the life and spirituality of St. Therese of Lisieux. Moreover, the best way to gather in the spirituality of Saint Therese is to read her autobiography, either in its traditional, edited version or in its full version. Nevertheless, I hope I capture in this note some of the key elements of St. Therese’s spirituality which, in turn, caused her to become a great saint and Doctor of the Universal Church. We may say therefore, in reference to the above quote, that Saint Therese loved God intensely and therefore fulfilled the purpose in life to which God called her. “But what I demand is love. I care now about one thing only – to love You, my Jesus! Great deeds are forbidden me, I cannot preach the Gospel nor shed my blood – but what does it matter? My brothers toil instead of me and I, a little child, well, I keep close by the throne of God and I love for those who fight. Love proves itself by deeds, so how am I to show my love? Well, I will scatter flowers, perfuming the Divine throne with their fragrance, and I’ll sweetly sing my hymn of love. Yes, my Beloved, that is how I will spend my short life. The only way I can prove my love is by scattering flowers and these flowers are every little sacrifice, every glance and word, and the doing of the least of actions for love. I wish both to suffer and to find joy through love” (p 156, Image Books edition). What did Saint Therese see with great accuracy (great spiritual insight)? She saw that God has a FATHER’S HEART! And growing up in a very affectionate home she knew that a good Father helps out his little children. And seeing clearly that God is an Infinitely Good Father, she realized that her littleness and weakness would draw down the Father’s help. She realized she could trust God…her Father…because she was a child, a daughter, of the Father! She saw she could take God by love! (Ref. The Way of Trust and Love: A Retreat Guided by Saint Therese of Lisieux by Father Jacques Phillippe). 2. She was a cloistered Carmelite nun (Born: 1873 in Alencon, France) who from as early as age three had an intense longing for God (a key element of her spirituality). She grew up in a very loving and Catholic household and her faith development was greatly influenced by her parents and older sisters. The early part of her autobiography recounts her childhood years and the many steps she took to gain early admission to the convent at Carmel at the age of fifteen. She would die nine years later. “The Blessed Virgin glowed with a beauty beyond anything I had ever seen. Her face was alive with kindness and infinite tenderness, but it was her enchanting smile that really moved me to the depths. My pain vanished and two great tears crept down my cheeks – tears of pure joy” (p.46). Therese was ten years old at the time she was cured by “Our Lady of Victories,” and approximately one year later she made an act of consecration to the Virgin Mary on the day of her First Communion. “Our friends were too worldly and too clever at mixing the pleasures of the world with the service of God. They scarcely gave a thought to death…. And I knew that all is fleeting that we cherish here under the sun. The only good thing is to love God with all one’s heart and to stay poor in spirit” (49-50). 5. The image of her as a charming French girl who gave her life to God by becoming a nun and offered up little sacrifices on God’s behalf is true and of great importance – and yet her life runs even deeper than that. Her life is the story of a girl and then a young woman who was radically in love with God and who wished to offer herself to God in an exchange of love that took her completely beyond herself and into God (nuptial union). “True love grows by sacrifice and the more thoroughly a soul rejects natural satisfaction, the stronger and more detached its tenderness becomes” (132). Renunciation is a foundational element of her spirituality. “After Holy Communion…I was seized with a passionate longing to suffer. I felt certain that Jesus had many, many crosses in store for me. My soul was flooded with such consolation that I regarded it as one of the greatest graces of my life. I was drawn to suffering” (53). The value of redemptive suffering is a key component of her life and spirituality. 8. Her favorite book, besides the Bible, is The Imitation of Christ, which is, in essence, a practical Christian handbook for overcoming disordered self-love. In Carmelite spirituality self-denial and mortification of the senses and spirit are means of purgation that open up our hearts to the love of God. Humility and littleness are foundational to Therese’s spirituality. “Unless you become like a little child you shall not enter the Kingdom of Heaven” (Matt 18: 3). Additionally, she draws great strength from the Bible. Therese’s “little way” of “making love the mainspring of every action” requires the profound, constant and universal mortification of self-love and self-interest. It is a little way but with huge implications for growth in holiness. The sweet, little way is a death – a death to self. Undergirding Therese’s little way, therefore, is an ardent love of God expressed by a sacrificial life. 12. Of Therese, Father Christopher O’Donnell says: “When we get beneath the language and culture of Therese, we find that for all her charm, she was almost ruthless in her pursuit of holiness in her complete sacrifice to God’s merciful love.” Thus, our own desire and determination to love and serve God, albeit supported by grace, is crucial if we want to grow in holiness. Our own effort to love and serve God is very important. “Strive for that holiness without which no one can see God” (Hebrews 12:14). 13. Therese underscores that we stray from the path of holiness when we take our eyes off of Jesus. This is a fundamental spiritual maxim that St. Teresa of Avila was fond of repeating:”Don’t take your eyes off of Jesus.” Therese states: “I resolved never to let my soul wander from the gaze of Jesus, so it could sail peacefully towards the shores of Heaven” (p.38). Like the apostle Peter, we begin to sink when we take our eyes off of Jesus. 14. She underscores the vanity of all earthly things, stating: “the only way to get happiness in this world is to remain in ignorance of all created things….I saw that He alone was unchanging and that He (God) alone could satisfy the immensity of my desires” (p.107). In our present times, we should reflect deeply on how our possessions and “things” impede our love of God. Although some possessions are necessary, we should renounce any attachment to them. 16. Despite her littleness, Therese had a prophetic intuition that God was accomplishing great things through her, despite the fact that she would not witness these things in her lifetime (talk about confidence in God!) She states in her autobiography: “I was made to understand the glory I was to win would never be seen during my lifetime – I shall become a saint.” What a prediction! She is no doubt the most popular saint of modern times. Her autobiography, The Story of a Soul, is one of the best selling religious books of all time. 17. In the months before her death from tuberculosis at the age of twenty-four, she suffered through a terrible dark night of the soul – battling heroically the temptation that her belief in Heaven was a mere illusion. It was only shortly before her death that this tempest of darkness broke, and there can be no doubt that Therese’s voluntary participation in our Lord’s passion during her dark night of abandonment won countless graces for many souls (and obviously continues to do so). Saint Mother Teresa of Calcutta also underwent a very trying and elongated dark night, so this type of abandonment and experience of desolation is a sign of great sanctity. 18. She is a saint of God’s divine mercy. From the opening line of her autobiography she is constantly praising the mercy of God. It is from God’s mercy that she draws her strength and confidence. Because of God’s incredible mercy, Therese is secure in her littleness and imperfections – knowing that God loves her in spite of her flaws and failures. Although she laments often falling asleep during meditation, she nevertheless remains untroubled by her weakness because she knows that God loves her even when she is sleeping! Thus, even when we sin and offend God we should never despair but rather put all our trust and confidence in God’s incredible – unfathomable – mercy! “Truly St. Teresa of Lisieux traced for us the simple road which leads to great heights. In her teaching, as it pleased Pope Pius XI to point out, the gift of wisdom appears in a lofty degree for the direction of souls thirsting for the truth and wishing, above all human conceptions, to live by the word of God….The way of childhood thus understood, especially as we see it toward the end of the life of St. Teresa of the Child Jesus, is very elevated in its simplicity. Its lofty simplicity comes home to us because the saint certainly passed through the night of the spirit (which corresponds to the sixth mansion of St. Teresa of Avila), as may be seen on reading chapter nine of the Histoire d’une ame. It was the reading of this chapter, some thirty years ago, that gave us the idea of explaining the night of the spirit by a profound and intense influence of the gift of understanding, which brings out in powerful relief the formal motive of humility and of each of the three theological virtues. Thereby these infused virtues are purified of all alloy or attachment to secondary and accessory motives on which until then the soul had dwelt excessively” (The Three Ages of the Interior Life, Chapter 41, regarding the way of spiritual childhood). 20. 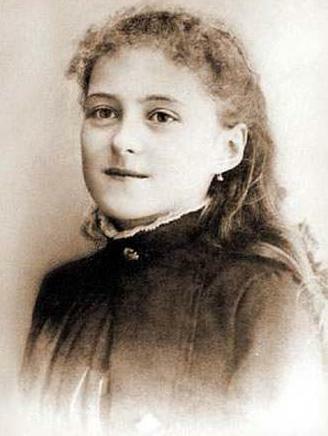 I think one could make a strong case that the Seven Gifts of the Holy Spirit were highly operational in Saint Therese’s life, even from an early age: the Gift of Fear in her reverence for God and holiness; the Gift of Piety in her tenderness and affection for God as Father; the Gift of Fortitude in her ability to overcome many difficulties and sufferings in the pursuit of holiness; the Gift of Counsel in her docility to the will of God; the Gift of Knowledge in her grasping the vanity of all earthly things that pass away; the Gift of Understanding in her profound understanding of spiritual truths and her ability to express them in written form; and the Gift of Wisdom in her union with God through love and contemplation . What I have said here is both cursory and inadequate and could be greatly expanded upon by many concrete examples from her life and writings. 21.Therese’s last words moments before she died in Carmel were: “Oh! I love Him…My God…I love You.” She died on September 30, 1897. 22. In 1898, 2000 copies of her autobiography were printed. By 1914, Carmel was receiving 200 letters a day regarding Therese and her “favors”; this number grows to 800 a day by 1923. 23. She was beatified in 1923 and canonized by Pius XI in 1925. 24. She was declared a Doctor of the Universal Church by Pope John Paul II in 1997. She is the patron saint of missions and the Secondary Patroness of France (behind her hero, Joan of Arc). Little Flower of Heaven, ora pro nobis!